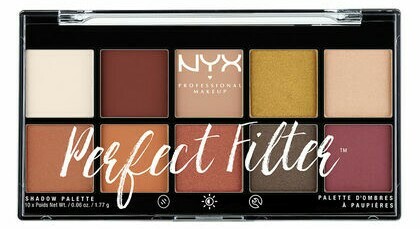 The NYX Perfect Filter Palettes ($20) are a brand new release for Spring 2017 and I picked up a few of them to review for you guys! 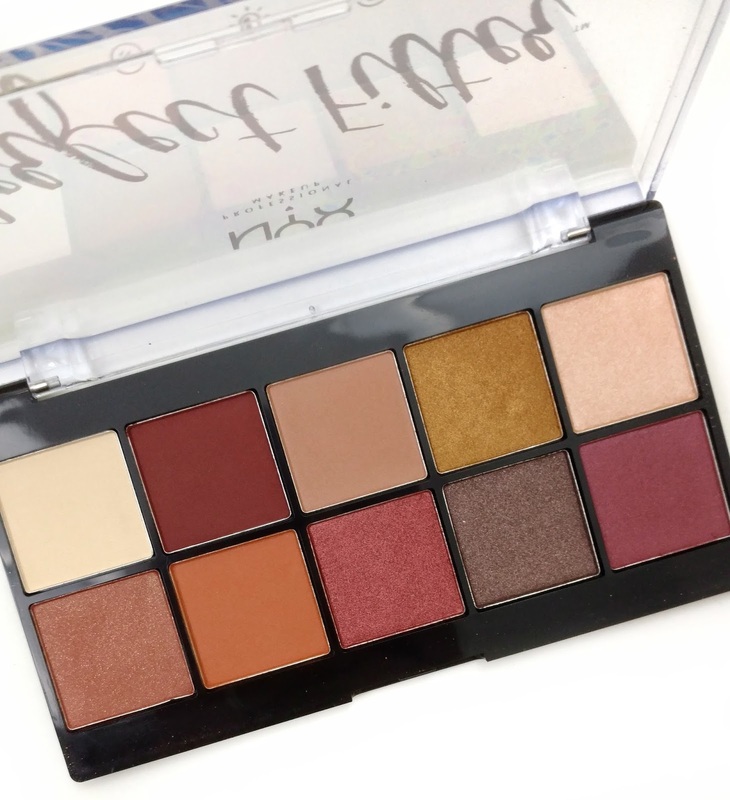 There are five shades (three of which are at Ulta), and all five are at NYXCosmetics.com. There were three that I really wanted to try, but the one I was most interested in, Rustic Antique was only available on the NYX website. I've been using it for about a week and a half now and I'm ready to share my thoughts! The first time I swatched this on my arm I was in love! The shimmers felt so smooth, as if they were creams (I had to double check!) and the mattes felt really velvety and soft. The color payoff was just incredible, making the higher $20 price point seem completely worth it...especially when compared to a $42 palette like the Anastasia Modern Renaissance. Unfortunately, some of the shades are not quite the same when using a brush. The shimmer shades still perform well, especially if you use a flatter, synthetic brush vs a fluffy one. They have a buttery, creamy texture so they "stick" to the skin really well. However the mattes are drier, so they kick up a ton of powdery fallout and blend out very sheerly on the eyes if you're not using primer. The good news is, using a primer helps tremendously and is a must with this palette. 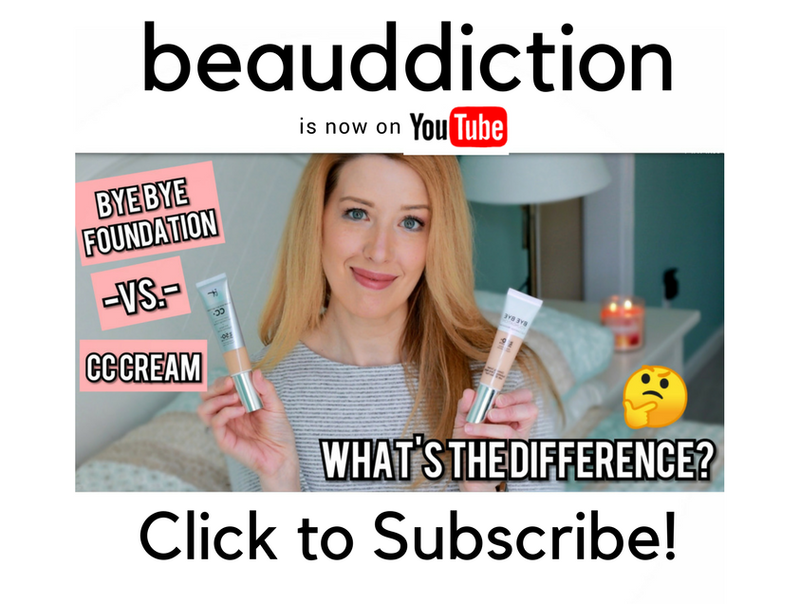 I tried using it both with and without primer, and when applied over my Lorac Behind the Scenes eyeshadow primer I got a really nice result, so it's not a loss for me since I always use primer anyway. 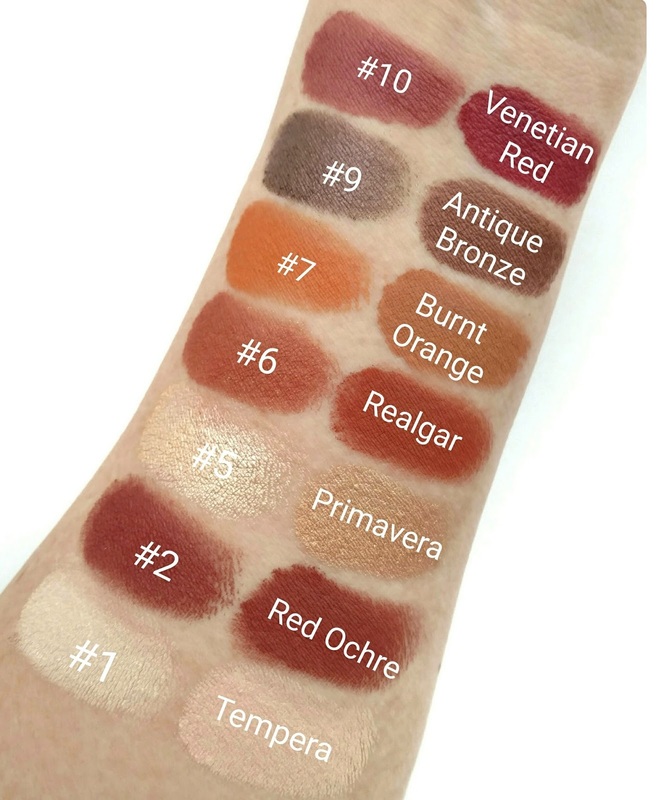 Below, you can see how amazing these shades are when swatched with a finger. I think this is the kind of formula that responds best to being "packed down", so when you're swiping into the pan with your finger, you're applying pressure which helps the pigments stick together. When using a brush, it stirs the powder up, rather than packing it down and makes for a more powdery, sheer result. 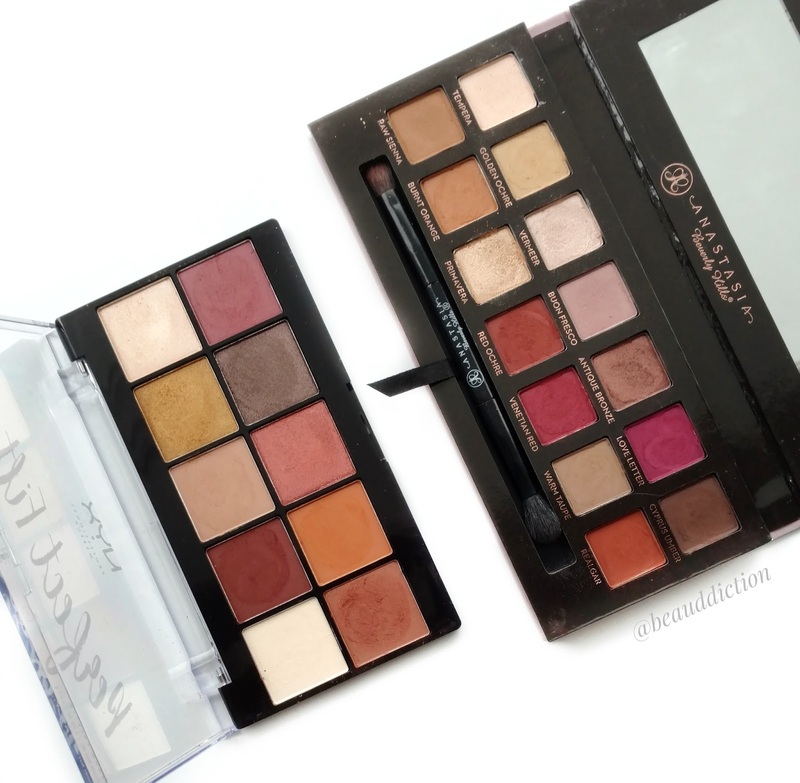 When I first posted this palette on my Instagram page, I got a lot of comments asking me to compare it to the Anastasia Beverly Hills Modern Renaissance Palette. Looking at them side-by-side, they really do look quite similar! Since the NYX palette doesn't have shade names, I numbered the top row 1-5 and the bottom row 6-10. 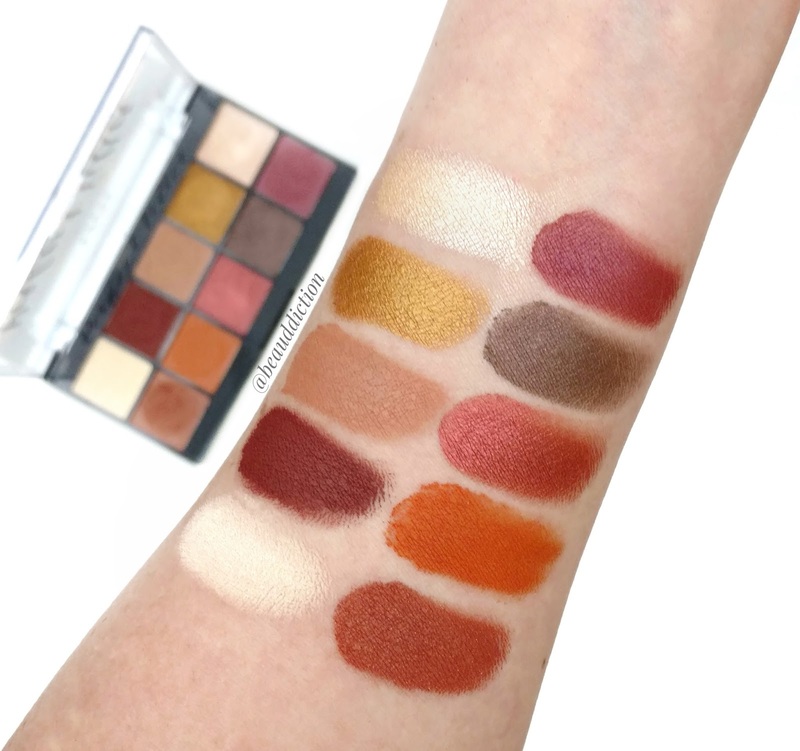 I only swatched the shades that I thought might be close to a shade in the Modern Renaissance palette. There are definitely some close ones..and #2 and Red Ochre are pretty much an exact dupe! Bummer! I saw your swatches on instagram and was planning to buy this. Glad I waited for your review first! If it was $10, maybe I would get it but the $20 price only made sense if it was on-par with the Modern Renaissance or other higher-end palettes. Thank you for always being honest, you're my favorite blogger! Aw thank you so much! :) I totally agree with you...it's not a bad palette but $20 is kind of steep. I bought this palette when it first came out and agree with your review. It is stun-ning when finger swatched but not as intense when used with a brush. It makes me think of the Huda Beauty Rose Gold palette, how it kept getting bad reviews but she actually said that the textured shadows need to be applied with your fingers for the best result. Some shadows are just like that! I have the one in Gloomy days. I got it at Ulta and I think it's a pretty good palette but a little expensive. If it was as good as high end palettes it would be worth the money but I think it should be more like $10 or $11. Would you say this perfect filter palette has similar formula with nyx avant pop? wow the swatches are BEAUTIFUL. unfortunate to hear about the quality issue though. I already have modern renaissance but I would love this for a cheap replacement once that runs out. Especially if you catch it on sale. I hope it's permanent.